This is a small St.Lawrence Iroquoian ceramic container, sometimes called a "seed pot", because of its diminutive size. Actually, a small hole, apparently punched through from the interior, has been used to suggest that this vessel was once used to transport glowing embers and that the intentionally placed hole was to provide oxygen to the coals. It was found in 1987 at the Maynard-McKeown site (BeFv-1) by James F. Pendergast, a research associate with the Canadian Museum of Civilization. 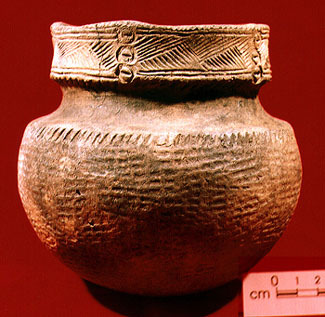 In all features except size, this pot is identical to much larger and more common containers of the St.Lawrence Iroquoian people (see Exhibit Specimen 20 for example) whose villages were especially numerous near the shores of the Upper St. Lawrence River of Ontario, Québec and New York state. 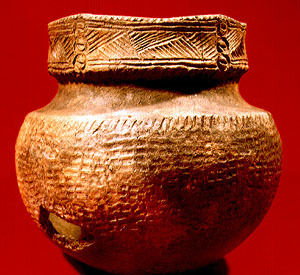 Like most Late Iroquoian ceramics, this pot has a well-rounded globular body with a well-defined smooth neck and a well-demarcated and decorated collar. The body has been carefully impressed or stamped with a paddle bearing raised rectangles. The shoulder, marking the transition to the smoothed neck is delimeated with short slightly oblique incisions. The rim is characterized by five slight projections or castellations (four are obvious while a fifth is quite attenuated). The collar is decorated with a regular pattern of incised and incision-filled triangles. Under each castellation are a column of three annular punctates, a hallmark of St. Lawrence Iroquoian ceramics. The circles within each punctate bears a horizontal line or stamp. The story of the St. Lawrence Iroquoian people contains many mysteries. A Late Woodland archaeological culture, the earliest sites attributed to them are on the order of 400-500 years old. A major question mark involves their ultimate fate. Met by Jacques Cartier at Hochelaga (on the island of Montréal) in 1535, they were nowhere to be found by the time Champlain visited the region some 70 years later. There is no doubt, however, that they were closely related to other Iroquoian peoples such as the Huron and different member groups of the Five Nations Confederacy. 1990 The Archaeology of the St.Lawrence Iroquoians. In The Archaeology of Southern Ontario to A.D. 1650. Occasional Publication of the London Chapter, OAS, No.5:385-404. 1991 The St.Lawrence Iroquoians: Their Past, Present and Immediate Future. The Bulletin (Journal of the New York State Archaeological Association), 102:47-74. 1993 More on When and Why the St.Lawrence Iroquoians Disappeared. In Essays in St.Lawrence Iroquoian Archaeology, edited by James F. Pendergast and Claude Chapdelaine. Occasional Papers in Northeastern Archaeology No.8: 9-47.